Pets Costs > How Much Does a Moluccan Cockatoo Cost? How Much Does a Moluccan Cockatoo Cost? The Moluccan cockatoo (Cacatua moluccensis), which originated from Indonesia, is considered to be one of the largest white cockatoo species, ranging in size based on the region it came from. Rosy pink in color, the Moluccan, like most cockatoos, are very sensitive and can become quite agitated and upset when neglected by its owner. Highly coveted as a pet, this bird, while rare in the wild, can commonly be found among various breeders located in the United States. 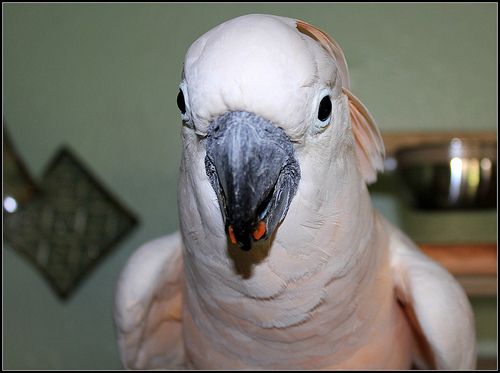 The cost of a Moluccan cockatoo, as with any bird adoption, will greatly vary on the breeder, the bird’s age, quality and where the breeder resides. From our research, the average cost of a high quality, weaned bird can range anywhere from $1,700 to $3,000. These birds can either be found at an avian-specialty store, via a bird breeder or, if locally available, an avian rescue organization. BirdsNow.com, a popular birds-only classified website, had close to 75 active listings at the time of this writing, with the prices ranging from $1,800 to $3,000. Singing-wings-aviary.com notes an unweaned Moluccan cockatoo can cost about $1,700, whereas a weaned bird can cost close to $2,200. These birds, when compared to other species, will require a larger-than-average cage so it can fly from one side to another with ease. At a minimum, this cage should be, at a minimum, 2 feet x 2 feet x 3 feet, but the larger the better. The metal bar spacing should be at least an inch thick, and a metal grate should be placed beneath the cage to allow the dropping to be seperated from the food and water to avoid contamination. The cage should be kept from the direct sun, and owners should ensure a moderate temperature is set at all times. Avoid any plastic or weaker material-based cages as these birds will be able to peck away at the material over time. Inside the cage should include a variety of perches, at least six inches long and a variety of toys to keep it mentally stimulated throughout the day. These toys can include chewing toys, food toys, puzzles, ropes and swings. If there’s not enough in terms of interaction, this can lead to feather plucking and destruction in general. Outside of the cage, while optional, a jungle gym should be considered, equipped with toys and a larger perch. Wherever you place a cage, you will want to consider a spot where your family spends most of its time. The Moluccan cockatoo feeds on a high-quality pellet diet, along with vegetables, grains, sprouts, dietary supplements and a general variety of finely chopped fruits and vegetables. Nuts and seeds are fine as long a fed in moderation. BeautyofBirds.com state that captive birds often feed on a parrot mix which contains nuts, seeds, dried fruits and vegetables. Additionally, they need to be fed fruits, vegetables and branches with leaves to keep them entertained. Like most cockatoo species, the females will often have reddish irises as opposed to the male’s black eyes. Females, when compared to the males, will also have a smaller size. As for noise, this bird is known to be one of the loudest captive birds, not making it a great choice for those who reside in an apartment or condo. It will tend to scream for no reason, whether it’s happy or afraid, and is willing to outscream any other bird. While they are not considered great talkers, they do mimic a few words. This highly sensitive and emotional bird can often go into a deep depression if seperated from its partner and/or doesn’t receive the attention/compassion it desires. Sizes range from 17 to 20 inches, with a wingspan extending as long as 42 inches. The weight varies from one to three pounds. The birds originated from the Southern Moluccan Islands and Eastern Indonesia. In good health, it’s not uncommon to see these birds live 50 to 75 years. This bird craves a lot of attention, and by attention, we mean three to four hours a day. A successful owner should be prepared to constantly play, handle and entertain the bird throughout the day to offer it the stimulation it requires. As they are not great at playing alone, it will need your attention and constantly ask for it in order to be happy, making it ideal for a bird owner who tends to be a homebody. Due to the attention it desires, it isn’t suitable for a majority of those looking to own a pet bird. Due to the aggression the bird can show, it’s highly recommended you keep them caged on their own as they have been known to keep their mates with their powerful beaks. Some common health concerns the bird is susceptible to includes feather disease, fatty liver disease, lipoma, bumblefoot or psittacine beak disease. If not provided enough mental stimulation, it is not uncommon to find the bird plucking away at its feathers.